A few airlines may have halted flights from the U.S. to Cuba, but if you ask locals in the country’s capital of Havana, they haven’t noticed a dip in the number of Americans visiting the country – in fact, they insist they’ve seen the opposite. Several Cubans working in the tourism industry told Fox News they’ve witnessed a marked increase in the number of Americans visiting the country each month. But they also openly expressed doubt that the boom would last – with many references to growing concern over changes President Trump may make to the recently relaxed regulations that have allowed more Americans to travel to the island nation steeped in political history. 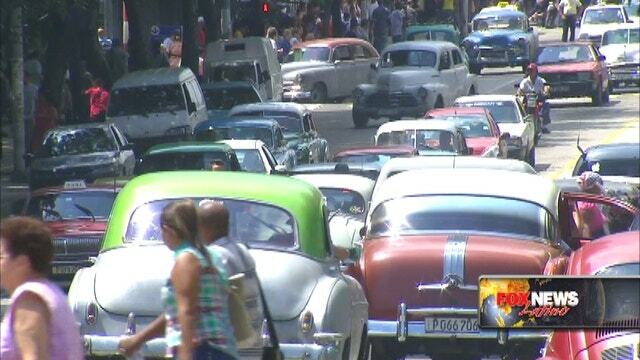 One guide, who wished to remain unnamed and leads a twice-daily walking tour of Havana in both Spanish and English, said the city has been “overwhelmed by tourists” in recent months. But he added that the future is uncertain, noting that Cubans followed the American election closely and are eager to see if Trump will make changes to former president Obama’s 2014 executive action that eased Americans’ ability to visit Cuba. In a November 2016 tweet, just days after Fidel Castro’s death, Trump threatened to “terminate” the deal Obama set in place. Currently, American citizens can travel to Cuba under 12 approved categories including family visits, professional research, educational activities and "support for the Cuban people." Another tour guide also said he is seeing “more and more” Americans visiting the country. The tour guide, who spoke candidly but did not wish to be named, said it has become more lax to travel from the U.S. and enter Cuba – with little regulation at either end of the trip. He noted he was curious to see if Trump would make changes, explaining he reads most of his news from local, state-run Cuban sources, like newspapers, but occasionally has Wi-Fi access and can read unfiltered news from the United States online if he wishes. WiFi in Havana isn’t easy to come by, with locals and tourists alike needing to purchase special WiFi access cards and then find hotspots where service is available. But American news websites all fully load when connectivity is available within Havana. The tour guide, a Havana native, added that he thinks the tourism industry is growing by word-of-mouth, mainly thanks to recent American visitors who are spreading the word to friends back home after successful trips. A third guide who runs an official people-to-people tour – which falls under one of the approved categories for visiting Cuba – was surprised to learn that airlines like Spirit and Frontier have cut their service to Havana. The mother of two recently left her job as a law professor to work for a tour company, explaining the business has been booming. In Cuba, most people are paid similar salaries regardless of the type of work they do. For some professionals, being a tour guide can be a more profitable occupation these days due to the sheer amount of tourists looking for people to take them around. She added she hopes things won’t change with any movements Trump may make as, in her eyes, the interest in Cuba is ever-increasing.